Jess Smart Smiley is a joke! Seriously. He makes rad pictures with his bare hands, has created 18 books for young readers, and has helped thousands of children, teens, and adults all across the world (including England, India, and Canada) in creating their first comics! 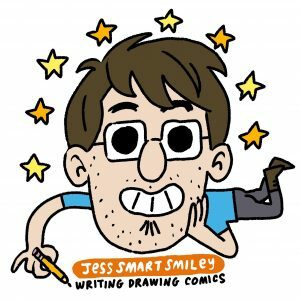 Jess has taught drawing, design, cartooning, and comics classes at schools, libraries, museums, book festivals, and conventions, and he’s always looking for the next great book to read. Jess has also created work for DisneyPixar, Penguin RandomHouse, Cartoon Network, BOOM!, and more. Hi! My name is Jess Smart Smiley and I make rad pictures with my bare hands. Not sure if you remember me, I was the girl at FCBD with the textbook sketchbook. It was great meeting you and checking out your rad sketchbook! I’m really terrible at giving advice, but I hope there was something you could use. I really like your style and can’t wait to read your full first issue at Conduit! What’s your twitter handle? MoandJinks will follow you! Thanks! I haven’t used twitter in a while, but my handle is jess_smiley. I saw your Ghost Comics in the Warp & Weave Journal at UVU. I worked as an editor on the issue. Your work was some of my favorite in there! Also, have you been submitting anything else to other journals? I’m starting a new journal, but I wasn’t sure if you take solicitations or not. Either way, your stuff is awesome. I love your work! I would love one day to have a comic made of me for my business! I’m an interior designer in Toronto. I have subscribed to your blog and I look forward to visiting often and getting inspired!! Awww. Thanks, Josie! Thanks for the kind words and for subscribing to my blog. I’m constantly intrigued and inspired by what others are doing and I feel it’s important to share their messages and processes. Let me know if there’s anything you’d like to see. In the meantime, I’m excited to check out your designs and message you about a comic. Thanks! hello, my son is having a bigfoot party in june. i love your finding bigfoot for one of the activities. do you have any downloads or can i purchase a copy? Hi, Rita! Thanks for the message–I’ll email you with details.